When you arrive we will do our best to meet your room bed type and smoking preferences as these are subject to availability. Colonial elegance abounds in this 49sqm stylish room. Enjoy complimentary high speed internet. Extra bed charge applies. When you arrive we will do our best to meet your room bed type and smoking preferences as these are subject to availability. Contemporary design meets Balinese accents in this newly renovated 49sqm room featuring iconic Balinese motifs, handpainted wall murals, and the latest technology including smart ipTV. A journey of unprecedented luxury. Enter the world of the Club InterContinental Suite Collection by a choice of spacious, high-end accommodations. Includes 24 hr. butler service, complimentary local calls, 2 pcs pressing per stay, exclusive return airport transfer, a choice of 5 breakfast venues, unlimited children’s program at Planet Trekkers, unlimited access to Club Lounge, Club Pool and Inspiration Space. Newly renovated 79sqm duplex suite with integrated living dining space, private balcony and split level ensuite master bedroom featuring iconic Balinese motifs. Enjoy the latest technology including a smart ipTV system, youtube, internet, and radio as well as service of the singaraja lounge. Extra bed charge applies. Our chic 79sqm duplex suites offer top floor privacy integrated living dining room daybed and balcony. The mezzanine master bedroom adjoins a marble bathroom with amenities. Indulge in free high speed internet and club privileges pool and butler. Extra person club privileges charge applies. 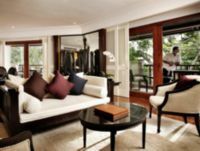 Balinese charm is key to this gracious 101sqm suite with living dining room and sun terrace with daybed. Indulges four poster bed and ensuite bathroom. Enjoy complimentary high speed internet and exclusive club privileges including pool lounge butler. Extra person club privilege charge applies. 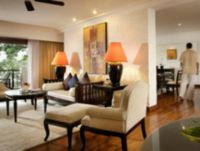 Elegantly styled 103sqm suite features chic living dining room with lengthy sun terrace above the pool. Includes jacuzzi bathtub and chaise longue. Connect with complimentary high speed internet and enjoy exclusive club privileges, including butler. Extra person club privilege charge applies. Sun filled 124sqm suite with fine ocean views reveals a chic living dining roomm, kitchenette guest bathrrom, and a private sun terrace with sunbeds. Indulge in a jacuzzi bathtub and enjoy complimentary high speed internet exclusive and club privilege and butler. Extra person club privilege charge applies. 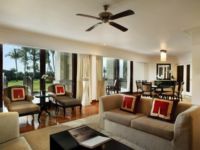 Our highest grade suite reveals 152sqm of opulence with lobby, separate living dining room, pantry and lengthy sun terrace with outdoor dining. Enjoy the master bedroom, ensuite jacuzzi bathtub, TV, complimentary high speed internet, club benefits, and butler. Extra person club privilege charge applies.